DES PLAINES, Ill., Sept. 17, 2018 — The National Insurance Crime Bureau (NICB) is expressing disappointment in Governor Edmund G. Brown Jr.’s August 27 veto of Assembly Bill 2169. Assembly Bill 2169 reduces the time from five days to 48 hours, following the expiration of the rental period, before a vehicle rental company may report a vehicle stolen. In his veto message, Governor Brown cites increased use of Global Positioning System (GPS) technology and unnamed “other solutions” as better approaches. While GPS technology certainly is one tool in curbing automobile theft, it is an exponentially useless tool if California car rental companies cannot report the vehicle stolen. Worse, criminals are becoming more skilled in locating and disabling GPS technology. According to NICB’s annual Hot Spots vehicle theft report, five of the top 10 U.S. Metropolitan Statistical Areas (MSAs), adjusted for population, for auto theft are located in California: Redding (4), Bakersfield (6), Modesto (7), Stockton-Lodi (8), and Yuba City (9). Assembly Bill 2169 passed both California legislative chambers with only one dissenting vote. The NICB applauds sponsor Assemblyman Randy Voepel and the California legislature for taking a step in the right direction toward reducing California auto theft, and looks forward to the legislation being reintroduced. DES PLAINES, Ill., July 12 — The Albuquerque, N.M. metropolitan statistical area (MSA) repeats as having the highest per capita auto theft rate in 2017, according to the National Insurance Crime Bureau’s (NICB) latest Hot Spots report. Hot Spots examines vehicle theft data obtained from the National Crime Information Center (NCIC) for each of the nation’s MSAs. MSAs are designated by the Office of Management and Budget (OMB) and often include areas much larger than the cities for which they are named. For example, this year’s number one spot, the Albuquerque, N.M. MSA, includes all thefts within the entire county of Bernalillo, not just the city of Albuquerque. New to the top 10 this year, the metro areas of St. Joseph (No. 5) and Springfield, Mo. (No. 10). As a population-based survey, an area with a much smaller population and a moderate number of thefts can—and often does—have a higher theft rate than an area with a much more significant vehicle theft problem and a larger population to absorb it. Which is how St. Joseph, with 952 thefts, places 5th while Los Angeles, with 60,444 thefts places 33rd. Each year the FBI releases preliminary Uniform Crime Report (UCR) data for the previous year’s January–June time frame. When the preliminary 2017 crime data was released earlier this year, vehicle theft was up 4.1 percent across the nation. That increase is reflected in today’s Hot Spots report and is expected to hold when the final UCR 2017 crime data is published in the fall. Overall, vehicle theft is down, dramatically, across the nation. The historic peak year for vehicle theft was 1991, with 1,661,738 reported thefts. In 2016, the total was 765,484. That is a 54 percent reduction since 1991. While the final result for 2017 is expected to be higher than 2016’s number (although the rate of increase is decreasing), the vehicle theft environment across the country has improved significantly since the 1990s. But it could be much better if vehicle owners just followed simple security advice. In a report published in October 2016, NICB found that for the years 2013 through 2015, a total of 147,434 vehicles were reported stolen with the keys left in them—57,096 in 2015 alone. With the debut of “smart keys” in 1997 and all of the improved anti-theft technology since, it is worthless if drivers continue to leave their keys in the car or leave their vehicles running, unattended, while they make a quick stop at a convenience store. Vehicle manufacturers, law enforcement and legislatures have been responsive to the crime of vehicle theft over the years, and the results are evident. Vehicle owners must guard against complacency and remember to heed simple tips to safeguard their vehicles. The full Hot Spots report is available at www.nicb.org. See the Hot Spots video here and a graphic here. A fisherman at the Ross Barnett Reservoir reported seeing something unusual on sonar and reported it to Reservoir police. What was reeled in was vehicle that was reported stolen 22 years ago. In this edition of NICB News we check in on the aftermath of Hurricanes Harvey and Irma, we’ll tell you why you should keep an eye on your vehicle this holiday season and we’ll tell you about a major case NICB was involved in. DES PLAINES, Ill. –New data released today by the National Insurance Crime Bureau (NICB) shows a total of 22,705 vehicles were reported stolen on the 11 holidays in 2016 covered in this report. NICB theft data is pulled from the National Crime Information Center’s (NCIC) stolen vehicle file which showed a total of 803,719 vehicle thefts for the year. 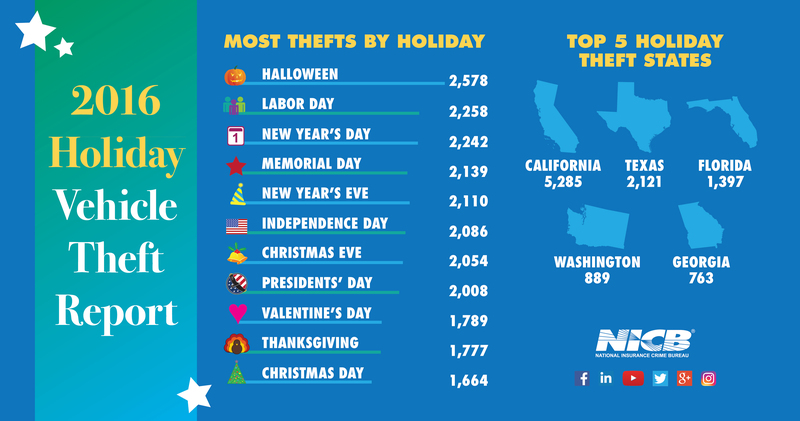 Halloween was the top holiday with 2,578 reported thefts. Halloween was followed, in descending order, by Labor Day (2,258), New Year’s Day (2,242), Memorial Day (2,139) and New Year’s Eve (2,110). Download the complete report here and an infographic here. The holidays with the fewest thefts in 2016 were: Christmas Day (1,664), Thanksgiving (1,777), Valentine’s Day (1,789), President’s Day (2,008) and Christmas Eve (2,054). California was the number one state with the most holiday vehicle thefts in 2016 with 5,285. It was followed by, in descending order, Texas (2,121), Florida (1,397), Washington (889) and Georgia (763). NICB reminds drivers to be vigilant and to secure their cars during this season as vehicle thieves are not filled with the holiday spirit. Some will definitely make a gift to themselves of your vehicle if you make it easy for them. Is Your City on NICB’s 2016 Hot Spots Report For Vehicle Theft? After rising to number two on the Hot Spots list last year, Albuquerque was chosen as the site of NICB’s annual insurance fraud and vehicle theft summit in the fall. Local and state authorities gathered to discuss the growing vehicle theft problem and address efforts to combat the problem in 2017. NICB recently ran billboard messages in the city aimed at reducing the theft rate. New to the top 10 this year, the metro areas of Anchorage, Alaska (No. 6) and Billings, Mont. (No. 10). As a population-based survey, an area with a much smaller population and a moderate number of thefts can—and often does—have a higher theft rate than an area with a much more significant vehicle theft problem and a larger population to absorb it. Which is how Billings, with 877 thefts, places 10th while Los Angeles, with 60,670 thefts places 35th. Each year the FBI releases preliminary Uniform Crime Report (UCR) data for the previous year’s January-June time frame. When the preliminary 2016 crime data was released earlier this year, vehicle theft was up 6.6 percent across the nation. That increase is reflected in today’s Hot Spots report and is expected to hold when the final UCR 2016 crime data is published in the fall. Overall, vehicle theft is down, dramatically, across the nation. The historic peak year for vehicle theft was 1991, with 1,661,738 reported thefts. In 2015, the total was 707,758. That is a 57.4 percent reduction since 1991. While the final result for 2016 is expected to be higher than 2015’s number, the vehicle theft environment across the country is vastly improved from the 1990s. In a report published last October, NICB found that for the years 2013 through 2015, a total of 147,434 vehicles were reported stolen with the keys left in them—57,096 in 2015 alone. With the debut of “smart keys” in 1997 and all of the improved anti-theft technology since, it is worthless if drivers continue to leave their keys in the car or leave their vehicles running, unattended, while they make a quick stop at a convenience store. Vehicle manufacturers, law enforcement and legislatures have been responsive to the crime of vehicle theft over the years and the results are evident. Vehicle owners must guard against complacency and remember to heed simple tips to safeguard their vehicles. WINK NEWS – Fraud could be behind a recent surge in auto insurance rates. Rates are up 21.4 percent since 2015, according to Florida Office of Insurance Regulation data. Read the story here. Police say criminals can use key fobs to disarm cars with the convenient entry option. Now they’re recommending car owners use The Club, which locks onto the steering wheel. Read the story here. Insurance Business – How bad is your state for hail? New data from the National Insurance Crime Bureau has listed hail as a top culprit for damaging motor vehicles. Read the story here. NICB recently obtained one of the so-called “mystery devices” that the public was first warned about over two years ago. At the time, thieves were being seen on security cameras across the country, using unknown devices to unlock vehicles and steal valuables inside. In recent months, NICB has noted reports of thieves not only opening the vehicles but also starting them and driving away. The device obtained by NICB was purchased via a third-party security expert from an overseas company. It was developed by engineers in an effort to provide manufacturers and other anti-theft organizations the ability to test the vulnerability of various vehicles systems. Called a “Relay Attack” unit, this particular model only works on cars and trucks that use a keyless remote and a push-button ignition. In a series of unscientific tests at different locations over a two-week period, 35 different makes and models of cars, SUVs, minivans and a pickup truck were tested. We partnered with NICB member company CarMax, because they are the nation’s largest used car retailer and have nearly every make and model in their inventory. Tests were also done at a new car dealership, an independent used car dealer, at an auto auction and on NICB employee vehicles and ones owned by private individuals. NICB was able to open 54% of the vehicles that were tested. The NICB was able to open 19 (54 percent) of the vehicles and start and drive away 18 (51 percent) of them. Of the 18 that were started, after driving them away and turning off the ignition, the device was used to restart 12 (34 percent) of the vehicles. NICB says there are a number of different devices believed to be offered for sale to thieves. Some use different technology and may work on different make and models and ignition systems. More expensive models may have a greater range and better capabilities for opening and starting a vehicle. Wehrle says it’s important for law enforcement officers to be aware of this threat and be on the lookout for thieves who may be using the technology. According to NICB’s Chief Operating Officer Jim Schweitzer, who oversees all NICB investigations, vehicle manufacturers must continue their efforts to counter the attacks on anti-theft technology. A look at the “mystery device” obtained by NICB. While there may not be an effective way of preventing this kind of theft at this time, NICB advises drivers to always lock their vehicles and take the remote fob or keys with them. Drivers should also be on the lookout for suspicious persons or activity and alert law enforcement rather than confronting a possible thief. It’s also a good idea to never invite a break-in by leaving valuables in plain sight. And once thieves get inside, they can easily steal a garage door opener and valuable papers such as the vehicle registration that could lead them to your home. So take the garage door opener with you and take a picture of your registration on your cell phone rather than keeping it in the glove compartment.